How much you choose to invest in the stocks in your dividend portfolio may be just as important -- if not more important -- as which stocks you choose to include in your portfolio. There are two primary strategies for asset allocation -- passive (equal weights) and active weighting (variable weights). Both strategies have their positives and negatives, so let's discuss both in greater detail. To illustrate the differences, we'll assume a $100,000 portfolio of 20 stocks with randomly-generated yields. In an equal-weighting approach, each investment receives the same amount of capital, regardless of its corresponding yield. In our example, each of our 20 stocks get a $5,000 investment (5% allocation). Once you know which stocks you want to include, you eliminate the extra step of determining how much to invest in each stock -- each one gets an (approximately) equal helping of cash. It seems really simple, but when it comes to investing, there's beauty in simplicity. By our very nature, we tend to overthink or be overconfident in our abilities, and keeping it simple can provide a hedge to our often-destructive tendencies. Equal-weighting may also improve sector diversification. Since higher-yielding stocks tend to cluster in a few sectors, you'll often find yourself overexposed to a few sectors if you're investing more in the highest-yielding stocks. Since each stock carries the same value in the portfolio, if one idea fails (i.e. dividend cut) then the others stand a better chance of picking up the pieces and minimizing losses. One downside to equal-weighting your portfolio is that...well, the portfolio won't stay equal-weighted long. As your stocks move up and down, some of your stocks will naturally become more or less than 5% of the portfolio's market value. If you like to keep your equal-weights nice and tidy, then, reweighting your portfolio on an annual basis will add to trading costs and could become a headwind to longer-term returns. With an equal-weight portfolio, there isn't much room for customization -- if you want to harvest a higher average yield or invest more in dividend growth stocks, this strategy isn't for you. In this example, we've invested more in the higher yielding stocks and, as a result, have created a higher average yield for the portfolio (4.95% vs. 4.53%). All else equal, you would expect the higher yielding stocks to grow their payouts at a lower rate than the lower-yielding stocks. 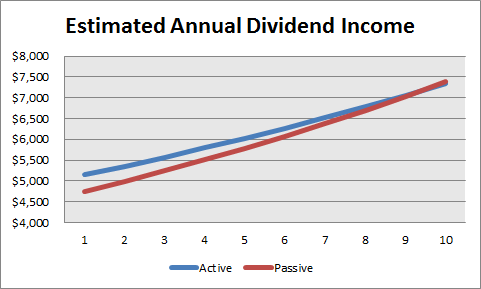 The starting yield difference may not seem meaningful at first, but consider this -- if the equal-weight portfolio's income grew at 5% annualized and the actively managed portfolio's income grew at 4% annualized, it would take the equal-weight portfolio ten years to match the annual payout of the actively managed portfolio. As the chart shows, an active approach can help tailor a portfolio to your individual needs. The weighting choices in this example, for instance, may be attractive to an investor seeking higher current income. On the other hand, someone with a longer time horizon and no need for current dividend income might put more money behind lower-yielding stocks with more growth potential. Active weighting allows more customization. In addition, if you fancy yourself a good stock selector or know a few companies better than the others, you can make larger bets in those names and potentially reap bigger rewards. The major negative to the active weighting strategy is that you're increasing your reliance on a few names. For instance, the top five stocks in our actively-managed portfolio example represent more than half (2.7%) of the starting yield. If one of those stocks runs into a hard time and cuts its dividend, it might impair the portfolio's longer-term returns. Conversely, in an equal-weighted portfolio if one stock fails, the repercussions to the overall portfolio will likely be less severe. In addition, you need to be mindful of your sector exposure -- the higher-yielding names may come from just a few sectors. Which strategy you decide to pursue will depend a lot on how you approach investing in general. If you're a hands-off investor or are new to investing, the equal-weight strategy may be more appealing. Investors with a little more investing experience and those who want to customize their portfolios may gravitate toward active weighting. And to be clear, active weighting does not equal active trading -- as always, give your theses time to work. If you do decide on the active approach, avoid weighting based on a single metric (yield, P/E, market cap), but consider a more holistic approach. Even if you want to increase your current income and aim to weight more toward higher yielders, make sure those higher yielders have other attractive attributes (i.e. good earnings and free cash cover, a relatively good balance sheet, and competitive advantages). Since those stocks will likely have a greater influence on your longer-term results, doing the extra homework is extra important.